When his style emulates Tim Sale's, it retains that sense of mesmerizing simplicity, but totally misses the beauty of the Long Halloween artist's linework. Where Sale's illustrations live and breathe, painting their way across the page, Boschi's work is unrefined, jerky and often clumsy. Often, his characters' facial expressions don't match what they're saying or doing. Yet, every once in a while a flicker of hope will peek through. Boschi has the tools to make something of himself… he keeps a good pace, and can tell a story with or without the aid of word balloons. He isn't there yet, but with a bit of refinement and a more discernible identity could become someone noteworthy. Like his partner, Jason Aaron's writing is a marked improvement over Daniel Way's efforts a few months back. His storytelling is much easier to follow, despite a few awkward shifts from inaction to sudden, jolting fireworks and knife fights, and he shows restraint and a knack for legibility in much of his dialog. I can safely say that this month's conflict is one of the more unique pairings I've ever stumbled across, and while it occasionally gets a bit too close to cliché for my liking, it never actually carries itself over the top in that respect. Even though it directly involves a battle between angels and repeated references to biblical material, the story really isn't what I expected. That's both a good thing and a bad thing – on one hand, Aaron is exploring new territory with a character that's badly needed that kind of a vision for decades. On the other, his quirky writing style and oddball situations have almost completely reversed the book's personality in a very short period of time. In my eyes, it's a welcome change because what came before was just rotten, but he runs the risk of alienating older readers by changing the game on them so drastically with little warning. 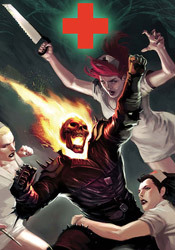 Ghost Rider is grasping for an identity right now, and while both Boschi and Aaron certainly provide something different in that arena, I'm not sure they're a permanent solution. But, to be fair, they are at the very least a step in the right direction. Flip through this, even if the character has never appealed to you. It's trying to reinvent itself, which is more than I can say for a lot of books in a similar predicament.